The Metolius Basin is a unique setting of gentle streams, cool springs, pine forests, abundant wildlife, fresh air, and mountain views. Located between the Cascade Crest to the west and Green Ridge to the east, the Basin’s length is traversed by the clear waters of the Metolius River and the creeks and springs that feed it. Residents and visitors to the Metolius experience the spirituality, calmness, and wonder that the natural elements of the Basin provide. A chronology of land and resource use in the Metolius Basin highlights the conservation efforts of those who cherish the natural values of the Metolius to protect this special place. 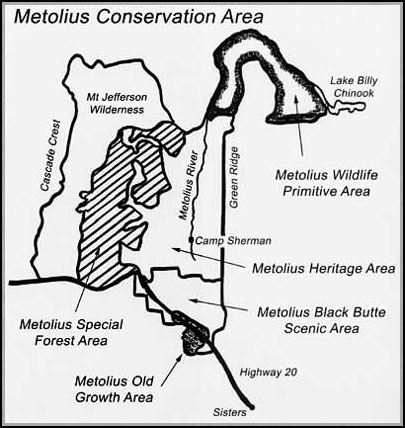 Additional historical accounts of life in the Metolius Basin are depicted on the Metolius Recreation Association web site. No destination resorts or golf courses in the region. 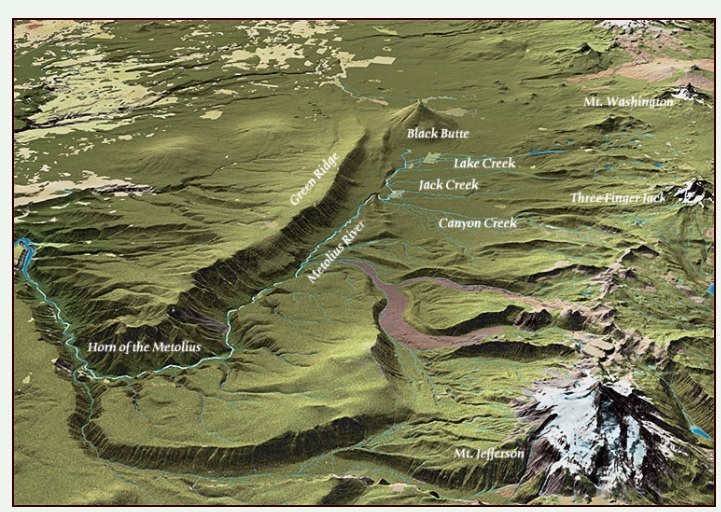 The boundary of the region protected extends beyond the Metolius watershed to within a few miles of Sisters on the south and southwest recognizing the potential impact of drawing large amounts of water from the ground water that feeds the river. Any new development in the region will not have a negative impact on the river or its springs and tributaries, on wildlife, or on fish. The legislation gives the responsibility to review and approve proposed amendments to the plan to the Jefferson County Board of Commissioners and the governing council of the Confederated Tribes of Warm Springs. The Ponderosa Land & Cattle Company will have the right to develop 100 residential units and 20 overnight accommodations on their property on Green Ridge including a restaurant and equestrian facilities. Metolius Heritage Area – These 28,000 acres cover the core of the Metolius Basin from the top side of Green Ridge on the east to just west of Road 12 in the middle of the Basin, and including the headwaters of Jack Creek. There is no scheduled timber cut and off-highway vehicles are prohibited. Any further campground development will be done in a way to relieve pressure on the river corridor. Metolius Black Butte Scenic Area – This area encompasses 10,600 acres on and around Black Butte with the objective of maintaining large, yellow bark ponderosa pine and the dark visual appearance of the Butte. It is in the timber base, but logging is to occur at a Retention Foreground level such that it would not be noticeable. Off-highway vehicles are prohibited. Lower Black Butte – the spectacular stand of yellow bark ponderosa pine along Highway 20 across from Black Butte Ranch. Street Creek – the sugar pine old growth area. Metolius Special Forest Area – These 18,400 acres in the Metolius Basin are between the Heritage Area on the east and the Mt. Jefferson Wilderness on the west. The area is in the timber base but will be managed under the “big tree” scenario so that all healthy trees over “24” in diameter will be retained. Metolius Wildlife Primitive Area – This area includes 15,000 acres in the rugged country around the Horn of the Metolius and the canyon country on the lower east side of Green Ridge. It also includes the isolated Fly Creek Canyon. The Wildlife Primitive Area is a unique land designation on the National Forest with its emphasis on protecting habitat for such wildlife as cougar and bear. The Recreational segment stretches from the south Deschutes National Forest boundary near the headwaters to Bridge 99 and is bounded by Road 1400 to the east and Roads 1419, 1420, and 1270 to the west. The Scenic segment starts at Bridge 99 and continues to Lake Billy Chinook with the eastand west boundaries following existing roads, section lines, and the high water mark of Jefferson Creek and the Metolius River. The Recreational segment is managed by the Deschutes National Forest; the Scenic segment by the Forest and the Confederated Tribes of Warm Springs through a joint management agreement. 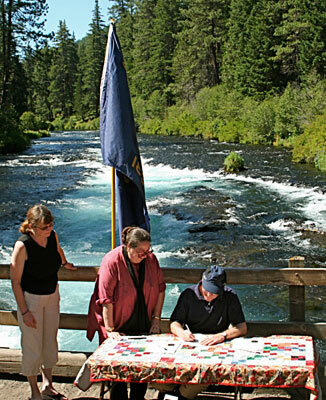 A summary describes the Metolius Wild and Scenic River Management Goals.